Magicshine’s new Eagle M2 has six ultra-bright LEDs, with the three at the top projecting a spot beam, and the three on the bottom a wide flood. There are three light modes — you can run all six LEDs together or select between the two rows individually. On full power, the theoretical light output is 2,400 lumens, but we measured only 1,737. 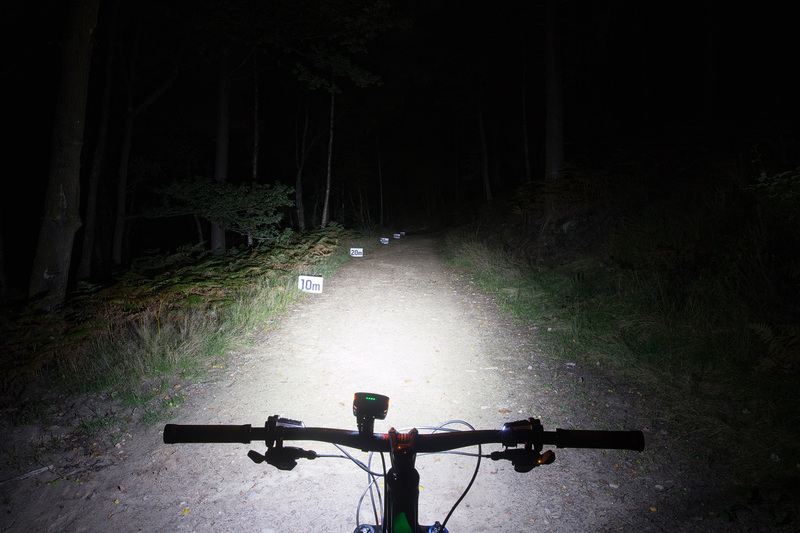 There are five settings in each mode, but the lower-power options are pretty dim and unusable off-road, registering barely 50 lumens. Adjusting the brightness, and modes, can be done on the lamp itself or via an optional remote. The latter doesn’t really integrate with any handlebar controls, and the rubber band attachment is a bit flimsy, which means the remote twists as you press it. The lamp clips into a bolt-on clamp. It’s a bit fiddly to install and lacks a 35mm option, but it’s rattle-free. The battery is housed in a shaped plastic case and has rubber attachment straps, one of which broke off during the test. The Eagle M2 creates a good pool of light close in around the wheel, which is great for technical riding, but it lacks the depth, so when tackling faster descents you will need to angle the light up by hand. With its plastic hardware and construction, the Eagle M2 doesn’t feel as solid as other lights on test, and is a little underpowered. But at less than a £100, this light is absolutely killer value. If you’re a night riding novice, this should be on your wish list.